Mr. Westinghouse is usually designa­ted as the inventor of the air-brake. By conveying the impression that he is a man with only one original achievement to his credit, this view of his career is really ludicrous in its inadequacy. There are probably few men who have struck out as much or as various work in the field of invention as Mr. Westinghouse, and probably none who have registered so small an average of failure. This is so true that among his business associates it has become a commonplace to say, in estimating the chances for suc­cess of any new mechanical contrivance, "If it goes with Mr. Westinghouse, it goes with the public." The air-brake, however, undoubtedly ranks among the greatest, as well as the first, of his achievements. In a way it was the touchstone of his genius from which were developed that quick instinct for a real, practical need as the basis for origi­nal work, and the keen business sense and perseverance that put such work successfully on the market. When he conceived the idea of the air-brake Mr. Westinghouse was a youth bf twenty. That was forty years ago, and since then the use of this device has become a matter of course in the running of all railroad trains. There is not a passenger line in the world today which does not count the air-brake as an essential of its equipment. In the United States it was made obligatory on all railroads by an act of Congress passed ten years ago. A unique feature in this remarkable triumph is that the air-brake is still in the hands of the inventor, protected by about fifteen hundred patents, and man­ufactured exclusively by him in the United States and in Europe. Forty years ago every car of a railroad train had to have its own brakeman, each working independently of the others, and with comparative slowness and uncer­tainty, at the sound of a far-away engi­neer's whistle. With the air-brake in use trains stop themselves automatically in case of accident; while in ordinary run­ning, a train can be brought to a stand­still in a very short distance by the movement of a single lever in the engines ­cab. The superlative success of an in­vention so thoroughly practical as this one, and so much in advance of the primitive mechanical methods in vogue during the early days of railroading, seems credible enough. Nevertheless, to gain recognition for his air-brake was probably the most difficult problem Mr. Westinghouse has ever had to solve. None of the railroad managers of earlier days would listen to the amazing claims made by the enthusiastic young in­ventor. Although he had served credita­bly in the engineering corps of the navy during the Civil War and, at the age of fifteen, had perfected a rotary steam en­gine of his own, as well as a railway "frog " - the manufacture of which he afterward abandoned because, it is said, he found it would never wear out. Mr. Westinghouse was practically unknown outside of his father's machine shop in Schenectady. With his lack of prestige it took a long time before even an initial test could be secured for the new invention. When a public trial was at last made, however, the success of the air-brake was proved beyond further cavil. Mr. Westinghouse now showed the shrewd, practical business side of his character. Instead of selling the air­brake outright to the railroads, he or­ganized a company and built a machine­ shop for its manufacture in Pittsburgh - the first of the long series of Westing­house works which have sprung up since then in more than one city in the United States and Europe. 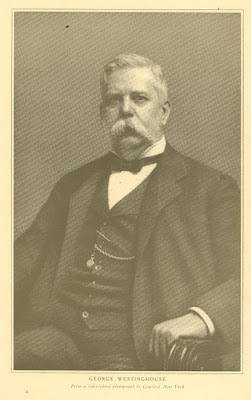 Possibly it was due to the wearying difficulties which he encountered in gaining a hearing for his own first great invention that Mr. Westinghouse in his subsequent career has ever evinced a ten­dency to give full consideration to the claims of new inventors seeking an ad­vantageous field for their productions. The consequence of this tendency has been that the thirty companies at pres­ent representing the Westinghouse in­terests have become the repository of greater number and diversity of in­ventions than have ever before been brought together in one gigantic com­bination. Approximately fifteen thou­sand patents are thus under the control of Mr. Westinghouse today. Of course, these patents have varied degrees of pro­ductiveness. The writer once asked Mr. Westinghouse if he considered them all valuable. "No," he answered, "many of them are not worth the paper they are written on. But it is sometimes cheaper to get rid of an invention by buying it." The capacity for investigating and finding out whatever is good in the origi­nal work of other men has made Mr. Westinghouse a leader in a field which is, according to him, more fruitful in inventions today than any other. When he first turned his attention to electricity the direct current system - a system meaning a great money outlay and a relatively small return - was alone in use. Recognizing its serious limitations in the transmission of power over long dis­tances, and looking about for a solution of the problem he had set himself, he chanced to meet Gaulard and Gibbs in Paris, twenty years ago. These two men were the discoverers of the alternating electric current. Mr. Westinghouse in­vestigated their discovery, found that it was what he wanted, and purchased the patents controlling it. The introduction of the new system, which Mr. Westinghouse has since ap­plied, with the help of numerous inven­tions of his own, to every field of elec­trical industry, was met with prolonged opposition in the United States. There was endless litigation in the courts, and newspapers were not lacking in indig­nant criticism. The new current was declared to be in the highest degree dangerous to human life, and all the re­sources of its indefatigable promoter were needed to counteract the prejudices thus aroused. The first great triumph of the new electric system came through its suc­cessful employment at Chicago. The contract to light the world's fair of 1893 was accepted by Mr. Westinghouse at a price one million dollars lower than the lowest rival bid, and was carried out so satisfactorily as to establish the excellence of the new system on a firm basis of popular approval. Now, of course, the alternating electric current is in wide use. The question of the tech­nical advantages of the alternating cur­rent over the direct current is still a subject of wide-open controversy among electrical engineers. But Mr. Westing­house has, at least, made the alternating current a prominent factor in electrical service. This revolutionary discovery in electricity has become the most important of the Westinghouse interests. In the complex personality of Mr. Westinghouse it would be difficult to de­termine the predominant quality - in­ventiveness or sheer industry and execu­tive ability. "The man who works" is the designation applied by those who know him best; and for downright, all ­round daily doing of things with hand as well as head, it is doubtful whether he has often been equaled, even in this age of stirring human activity. His own inventions cover almost every phase of railroad development having to do with the safeguarding of life and prop­erty, and extend, besides, over a range of subjects far too diverse to enumer­ate. Of the fifteen thousand patents controlled by him, more than three hun­dred represent those inventions of his own which he has carried to a successful completion. Now at the age of sixty and in the multiplicity of large and ur­gent interests demanding his constant, personal supervision he still finds time to plan and bring out new inventions­ and this branch of his ceaseless activi­ties he calls his play. Among the Westinghouse factories and offices in Pittsburgh there is one small building known as " Mr. Westing­house's machine shop." This is run as his own private department. It is not connected with any of the Westinghouse companies - although, in a way, it is the nucleus, a sort of clearing-house, of them all. Whenever he is in Pittsburgh, Mr. Westinghouse spends a part of each day there, working with his own hands over some new contrivance which the ex­igencies of the manufacturing world have suggested. This private shop maintains a corps of thirty or forty mechanics and drafts­men whose sole business it is to develop his ideas down to their minutest detail. Mr. Westinghouse is himself an expert draftsman. It is his custom, when he is away from Pittsburgh, to make a sketch of any new idea for a machine or mechanical device which occurs to him. This sketch he sends to the manager of his private shop, with instructions by telephone, if possible, as to how the new idea shall be developed and put into con­crete form for his inspection on his next arrival in Pittsburgh. With outsiders Mr. Westinghouse is extremely reticent in regard to his in­ventions. He never divulges any of the schemes over which he and his co-laborers are working until he has seen them through the last test that can be applied in the privacy of his own machine-shop. Having passed this ordeal, his inven­tions are ready for the factories of the Westinghouse companies - which boast that, on account of this careful prelim­inary method, none of their patents have ever been assailed. By those who know him intimately Mr. Westinghouse has been described as "a concentrated personification of busi­ness." With his herculean frame, hands hardened and scarred by constant con­tact with tools and machinery, keen eyes, and face expressive of a mind ac­customed to act quickly and to form pre­cise and unerring estimates of the multi­tude of men with whom he has daily dealings, one easily recognizes in him a man with an almost boundless capacity for work of all kinds. Nevertheless, on account of the ex­treme diversity of his interests, Mr. Westinghouse is a man without a fixed routine. He maintains a firm grip on the detailed operations of his many fac­tories and companies; but as the latter are scattered throughout this country and Europe, he is compelled to travel continually in order to keep in personal touch with them. His head office is in New York, where the managers of his thirty companies meet and confer with him, reporting the progress that has been made in the many enterprises which, in their general features, he has previously outlined. There is no lost time in a day with Mr. Westinghouse. He directs the work of his thousands of employees even while he is traveling with his secretary from factory to factory in his private car - a palatial house on wheels, unique in the perfection and comfort of its appoint­ments and in its adaptability to the daily needs of one of the world's busiest men. So much of his time is passed in this private car that it might almost be count­ed as one of his homes. Mr. Westinghouse, however, calls Pittsburgh his home. He and his wife usually spend the summer months at their country­seat in Lenox, Massachusetts, and divide the winter between their residence in the Blaine mansion in Washington and their apartments at the St. Regis in New York. Mr. Westinghouse is easily accessible to his workmen, with whom, it is said, he has never had a labor disagreement, and with whose personal affairs he is more or less familiar. He has little time, however, for social enjoyments usual to men of his wealth and position. From the inquisitiveness of those who are not connected with him he has kept systematically aloof. He hates publicity and speaks with indignant feeling of the unjust treatment, as he terms it, that has been accorded, in this respect, to such men as Mr. Rockefeller by the press of the country. Thus, in shunning possible notoriety, although Mr. Westinghouse gives a great deal of money dur­ing the year to all kinds of charitable or­ganizations applying to him, his name does not appear with his donations, for the stipulation is always made that his contributions must be anonymous. Many a struggling inventor, however, remem­bers that it was Mr. Westinghouse who opened for him the path to success. Of the thousands who have come in contact with his robust, intense personali­ty, few forget the stirring impression made by this" Man Who Works."